Duluth, July 12, 2018 — Georgia Asian Times celebrates the 25 Most Influential Asian Americans in Georgia with an awards gala at Sonesta Gwinnett Place. Over 200 guests along with key dignitaries witnessed the awards ceremony honoring the 25 honorees. Among the dignitaries including Hon. Takashi Shinozuka, Consul General of Japan and Hon. Daniel Hung, Deputy Director General of TECO Atlanta. “We are proud to honor the achievements and accomplishments of each of the honorees. 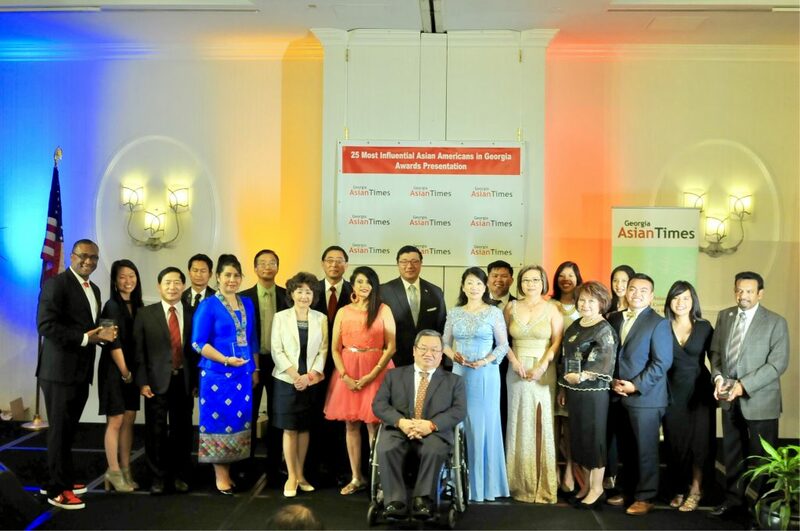 We would like to recognize their dedication and positive representation of Asian Americans in the community,” said Li Wong, Chairman of Georgia Asian Times. Nick Mason, Chief Economic Development Officer of Partnership Gwinnett, delivers the keynote address at the gala. He shared his insights on the multicultural population in Gwinnnett which he considers as the “living laboratory” for the consumer trends of America. This year’s honorees included 14 males and 11 females who made an impact in arts, business, government, politics, social work, education, healthcare, and areas that influence every aspect of Georgian’s daily life. The honorees are picked by a selection committee who are active in the Asian Pacific community and the editorial staff of GAT. Selection criteria for this year’s nominees includes honorees contribution and enhancement to the Asian Pacific community. GAT is also presented the Asian American Spirit Award to Hong Kong Dragon Boat Festival, recognized for its dedication for promoting cultural understanding and well being in the community.